Join writer and performer Ann Blake on an interactive journey through The Museum of Mythological Water Beasts at Ormston House. Trace looks at a series of works, inspired by the River Shannon, created by a team of artists over a period of six months. Blake creates a storytelling response to the exhibition in the character of the Museum Director. Performances last approximately 20 minutes followed by refreshments. Audience limited to 15 places. To book you free ticket, visit Eventbrite here. Ann Blake is a director, performer and writer in theatre; a founding member of Choke Comedy Improv and a musician with The Brad Pitt Light Orchestra. She was recently selected for Fishamble’s A Play for Ireland playwright development. She premièred and performed the award-winning play The Morning After The Life Before in the Belltable in 2017 which has toured to Canada, UK and is bound for New York in 2019. The Museum of Mythological Water Beasts is a multi-year project inspired by the River Shannon and the people of Limerick. We began with an open research process, working with local catchment custodians – including artists, boat-builders, historians, and scientists – through a series of events, workshops and field trips about, along and on the river. In 2018, we have returned indoors to develop a series of artistic commissions and exhibition-environments at Ormston House. Trace by Ann Blake is commissioned as part of the Museum of Mythological Water Beasts kindly supported by the Arts Council of Ireland Visual Art Project Award. To book you free ticket, visit Eventbrite here. 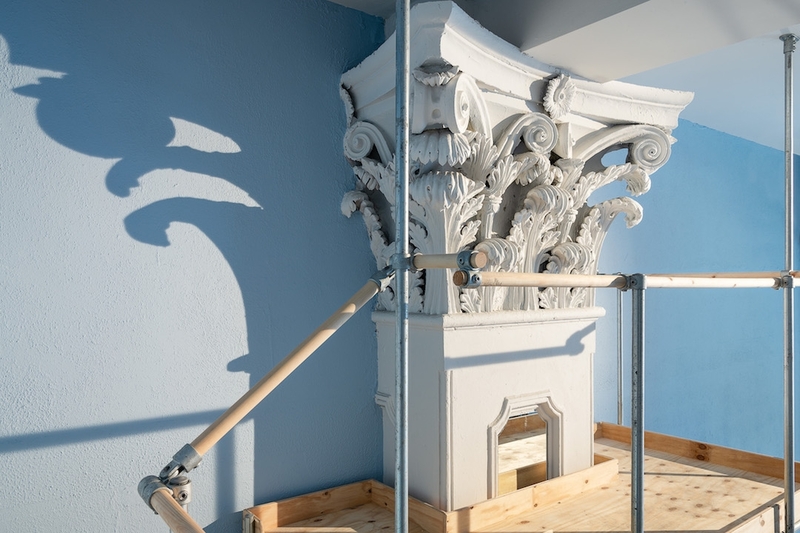 Image: details of Ormston House pilaster and Height (2018) by Andreas Kindler von Knobloch, Tom Watt and Tanad Williams. Photograph by Jed Niezgoda.